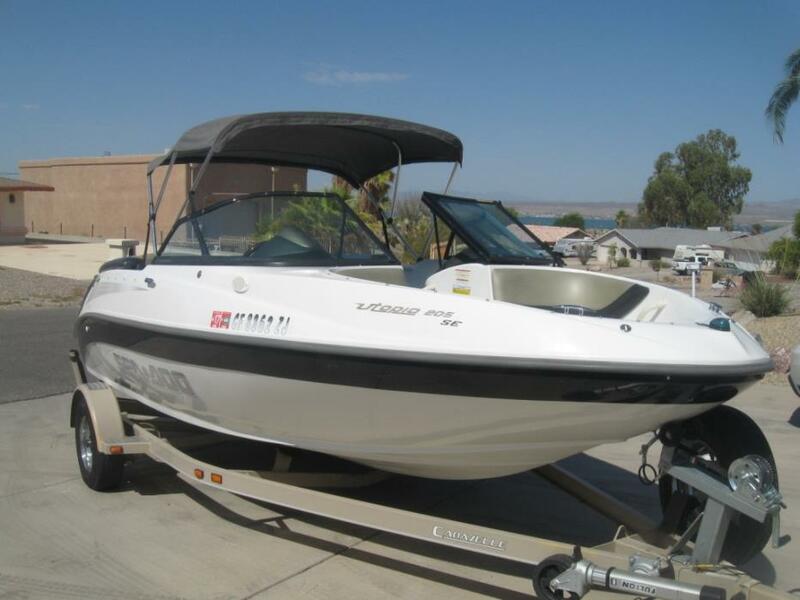 This Sea-Doo appears in very nice condition and being sold by the original owners. There are only 150 total hours on the boat and motors. The boat is always trailered and has no bottom paint. There is a Bimini top that is stored in the engine compartment. Stock #144102 Excellent Condition, Super Fast. Ready for endless recreation. 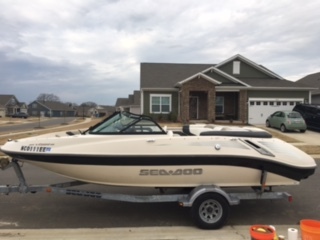 If you are in the market for a jet boat, look no further than this 2008 Sea-Doo 205 UTOPIA SE, priced right at $20,500 (offers encouraged). 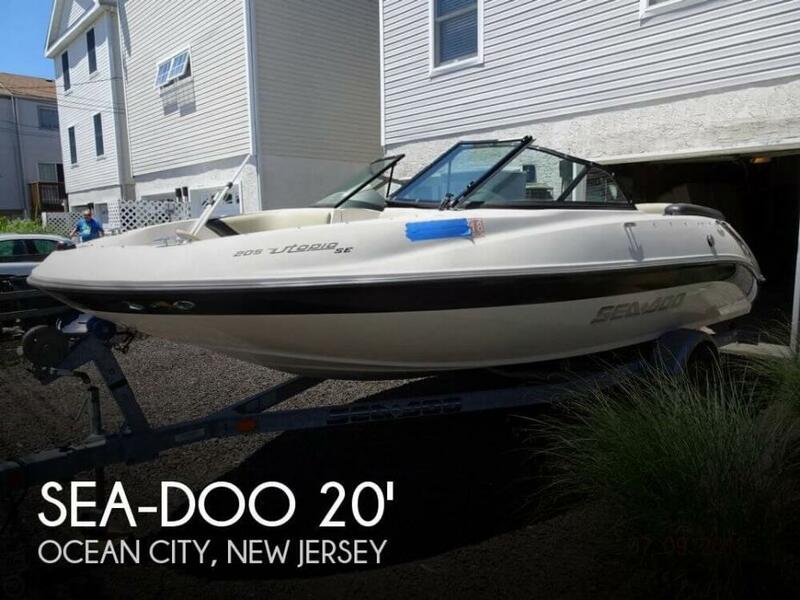 This boat is located in Ocean City, New Jersey and is in great condition. She is also equipped with twin Rotax engines that have only 150 hours. Reason for selling is have another boat. 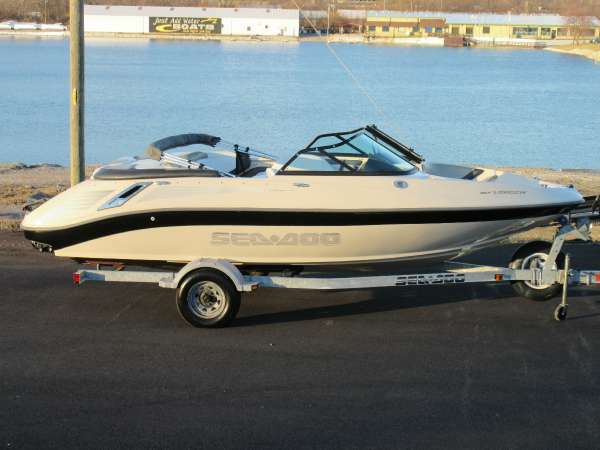 2007 SEA DOO 205 UTOPIA SE, THIS GRETA LOOKING AND SUPER CLEAN SEA DOO 205 UTOPIA SE IS FAST AND FUN. SHE'S OUTFITTED WITH TWIN 155 HP ROTAX ENGINES FOR A TOTAL OF 310 COMBINED HP. THERE'S ROOM FOR 8 PEOPLE ON BOARD AND THE HIDE-A-WAY BIMINI TOP KEEPS THE LINES CLEAN WHEN NOT IN USE. STORAGE ABOUNDS WITH THIS BOAT INCLUDING A HUGE SKI-LOCKER, STORAGE UNDER EACH SEAT AND EVEN MORE STORAGE ABOVE THE ENGINE BAY. IT'S EVEN EQUIPPED WITH A DEDICATED ANCHOR LOCKER. OTHER COOL FEATURES INCLUDE A COCKPIT TABLE, BATTERY SWITCH, LONG BOARDING LADDER, EXTENDED SWIM PLATFORM AND CUSTOM MATCHED TRAILER W/ SWING-A-WAY HITCH. 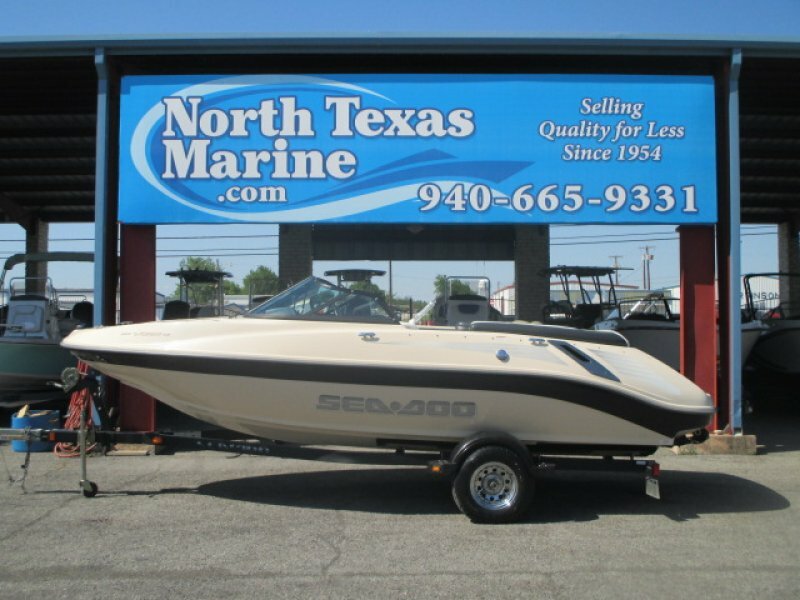 2009 Sea Doo 205 Utopia The 205 Utopia SE is among the most rewarding of the good life many rewards. Its ultra-cushioned front swivel bucket seats, burl wood steering wheel, cockpit table, and concealed bimini top pamper you. Features: Stringer system composite FRP,foam filled Cleats stainless steel, pull-up Cup holders stainless steel (7) Rub rail stainless steel Grab handles (10) Non-skid decking Navigation light Courtesy lights (3)Tow eyes stainless steel bow & Stern Ski eye stern Swim platform Reboarding ladder rear (2-step) Engine access Engine blower Auto bilge pump Storage: Ski locker, lockable Under seat Side compartment storage Sunpad, lockable Glovebox Control Station Helm: Steering Burlwood Horn (chrome) Combined shift & throttle lever Battery switch rear storage Fuse box DESS magnetic lanyard key Gauges backlight & anti-fog Fuel level Overheat engine warning Speedometer 88 mm Tachometer 88 mm (2) Analog fuel 47 mm Depth finder Cockpit: Carpet snap-in Dash finish Vinyl covered Black /Burlwood Outlet 12 volt accessory (1) Table Table mount rear Seating:Driver Seat Track & swivelPassenger Seat Buddy swivel Stereo & Sound: Stereo system satellite-ready AM/FM/CD Speakers bow (2) Speakers cockpit (2) Stereo remote MP3 port Canvas & Miscellaneous: Cockpit cover Tonneau cover Bimini top Windshield fixed TRAILER: Single axle Disc brakes Swing-away tongue Painted trailer Engine Information:Manufacturer: RotaxModel: 1503 4-tecYear: 2009Horsepower: 310Cylinder: 3Propulsion Type: JetQuantity: 2Fuel Type: GasDisplacement: 1494 Cubic in.Stroke: Four Stroke Options: Wakeboard tower Mirror Mooring cover Galvanized trailer Call for details. Thanks for viewing. 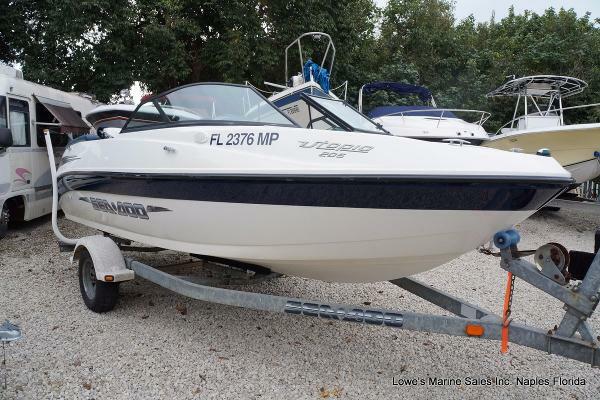 2008 Sea-Doo 205 Utopia SE 2008 Sea-Doo Utopia 205 SE with 2008 Karavan Trailer. Both titles in hand. Well maintained and kept covered in storage when not in use. Bimini top, snap on cover, and snap on bow cover included. New Clarion radio AM/FM/CD/AUX/Bluetooth capable with new JL Audio marine speakers. Passenger seat swings to create L-shaped lounge area with optional table. Table and bimini are stored under the back sundeck which pulls up on hinges. Full tune up done on both 4-TEC 1503 Rotax engines 10/19/16. There are 128 hours on the boat total. 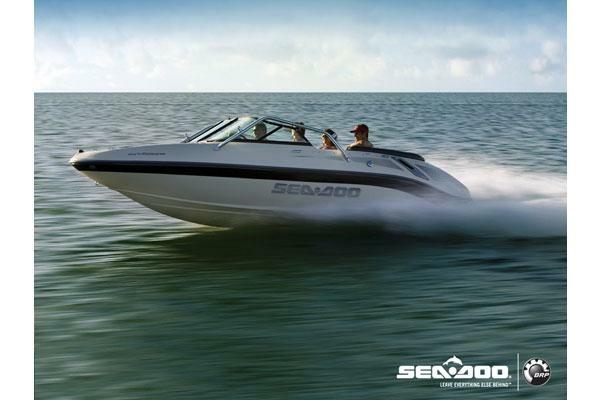 This boat has 430 horsepower and flys up out of the water with ease for a smooth ride. Depth sounder, burlwood steering wheel, snap in carpet, charger in glove compartment, all lights in working condition. Very good condition all around! 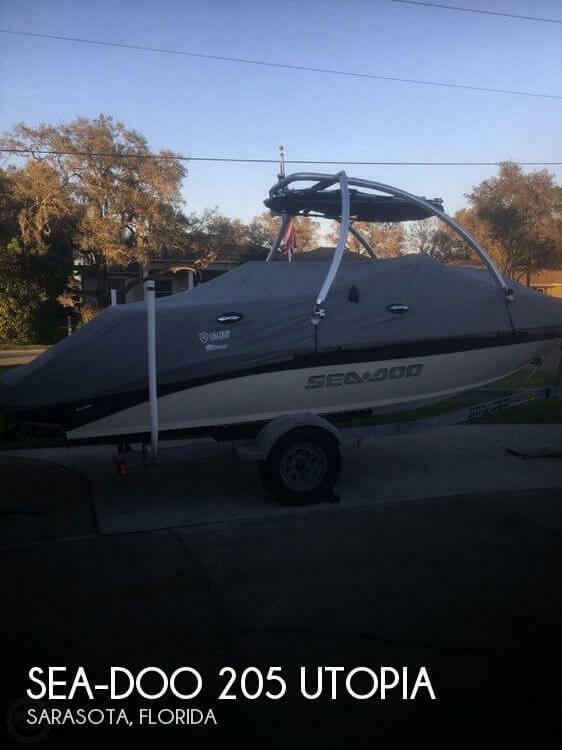 2006 Sea-Doo 205 Utopia SE 2006 Sea Doo Utopia. Great shape. Less then 100 hrs. on motors. Never used in salt water. Bimi top. Twin 155's for 310 hp. 45+ mph. Seats 8. Second owner, well maintained, regular details, covered and garaged. New snap on bow and cockpit cover. Upgraded single axle trailer w/disk surge breaks, removable tongue. Awesome, fun, family boat ready to go!! 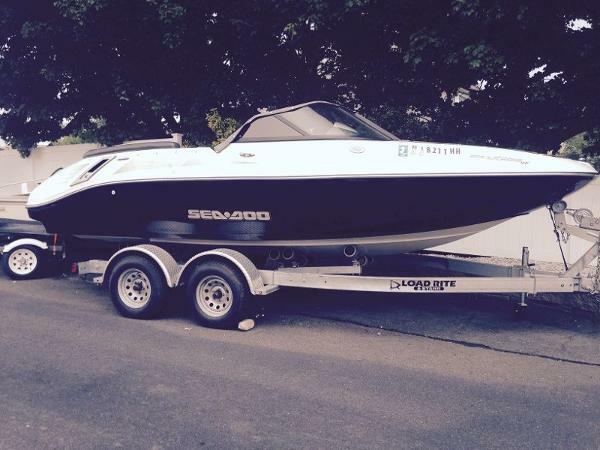 2004 Sea-Doo Sport Boats 205 Utopia SE 2004 Sea-Doo 205 Utopia with trailer. Mercury 250 hp Optimax M2 Jet Drive. The Utopia 205's walk through windshield was high enough to provide good protection against spray, even in the nasty little chop running on our test day. It gives access to the bow seating area, large enough for two adults to lounge comfortably, and the swivel bench seats (buckets optional) provide comfortable, secure seating when running, and a comfortable conversation or eating area when anchored or beached. acceleration is very good, and with only one turn, lock-to-lock of the wheel, steering is quick and precise. Even at a top speed of very close to 50 mph, a full hard over turn is able to twist the boat 360 degrees without any sideslip and without stalling out. Can't do that in a prop boat! The 250-hp Mercury jet drive package in the test boat performed flawlessly. The jet drive is the safest way to go if you are going to have kids, or adults for that matter, swimming or boarding in the stern. 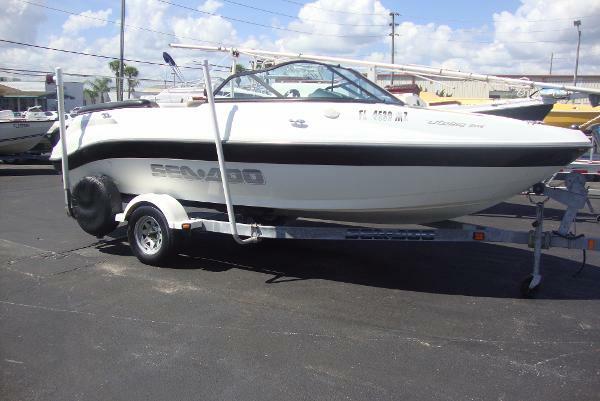 2004 Sea-Doo Sport Boats 205 Utopia SE One owner, all fresh water, extremely low hours, Merc/Jet 250 Hp !!! This baby scoots !!! Guaranteed to put a smile on everyone's face !!! This makes boating fun !!! Really. This model drives like a Porsche. Very fast and handles great ! Will pull tubes and wakeboards with ease. Bimini top, stereo, entertainment seating with removable table. Runs and looks great. Comes with factory matched trailer. This is a good one ! 2007 Sea Doo 205 Utopia SE 2007 Sea Doo 205 Utopia SE Serviced Under 100 Hours Twin 155HP Motors 310HP Total 4-Tec 4 Stroke, Bimini, Full Enclosure, Stereo- AM/FM/CD/AUX Plug In, Snap in Carpet Throughout, Custom Trailer. 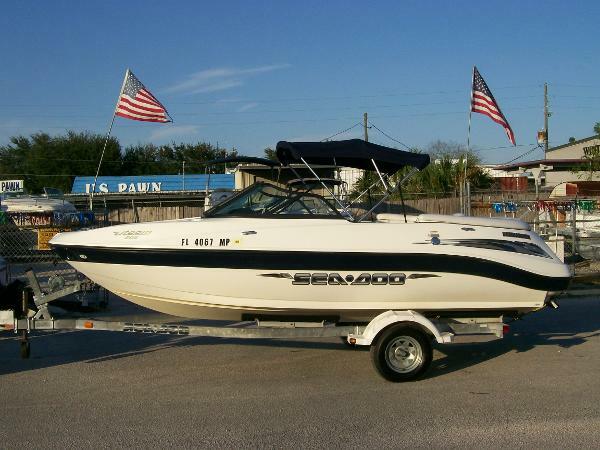 Excellent Condition.We are premier preowned watercraft & powersports dealer in Naples. We hand select every unit.We accept trades. 2002 Sea-Doo Sport Boats 205 Utopia SE This is a nice and clean 2002 Sea-Doo 205 Utopia powered by a Mercruiser 4.3L V6 M2 jet drive motor that has only been used in Freshwater. It comes with a Full cover, Bimini top, CD/stereo, cockpit table, large rear sunpad, swim ladder and more. Includes a factory matched single axle trailer. $10,995.00 or finance for $109.00 per month W.A.C. 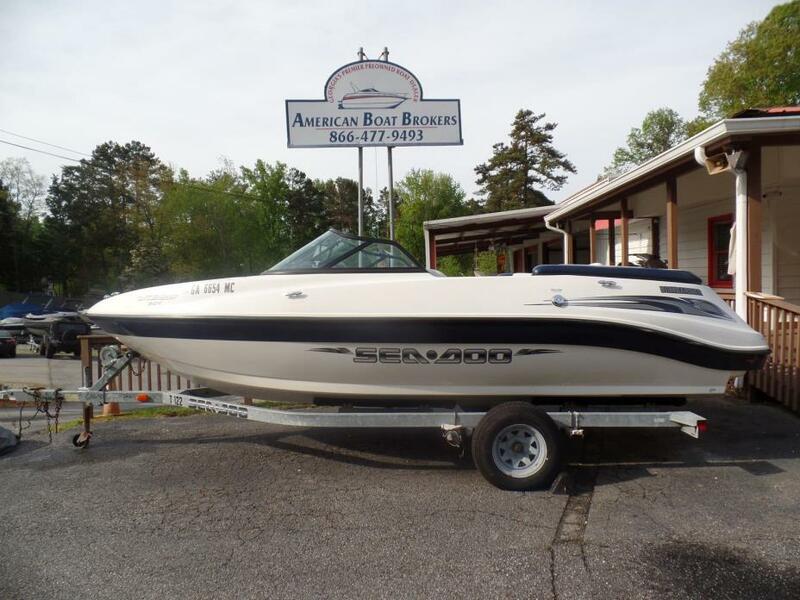 For more information on this 2005 Sea-Doo or almost 100 pre-owned boats in stock call or email American boat Brokers today! 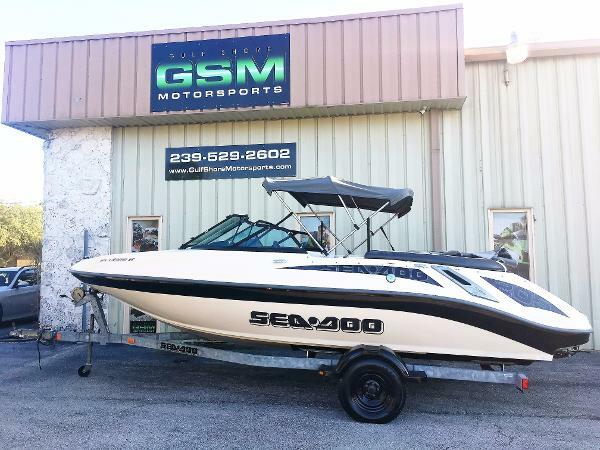 2005 Sea-Doo Sport Boats 205 Utopia SE This is a nice and clean 2005 Sea-Doo 205 Utopia powered by a Mercruiser 4.3L V6 M2 jet drive motor that has only been used in Freshwater. It comes with a Full cover, Bimini top, CD/stereo, cockpit table, large rear sunpad, swim ladder and more. Includes a factory matched single axle trailer. $11,995.00 or finance for $109.00 per month W.A.C. 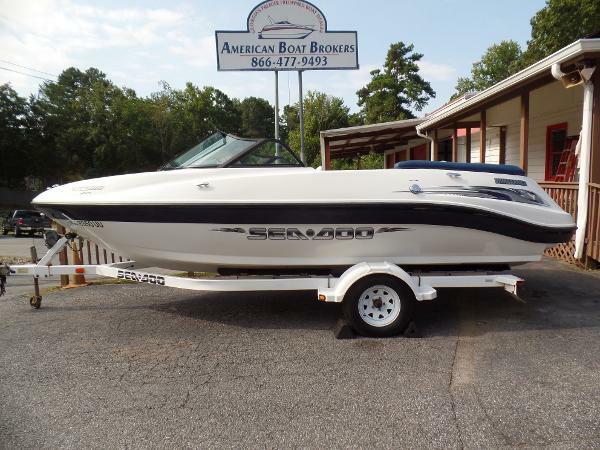 For more information on this 2005 Sea-Doo or almost 100 pre-owned boats in stock call or email American boat Brokers today!